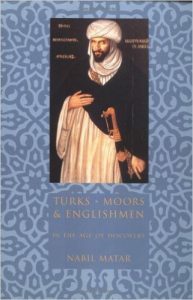 The reason for the latter superimposition was that the Turks were the rulers of North Africa—they were conquerors of the native Moors. But then Foss added that the dress of the Turks makes them “appear more like monsters than human beings.”There were no humans among the Muslims. Either there were monster-like Turks, or Indian-like Moors. To confirm this image of the “barbarians”—a term that would henceforth be used repeatedly in American accounts of captivity among the Muslims—28 Foss described in great detail the cruelty of the Muslims to the slaves, and elaborated on the various kinds of punishment that were meted out in North Africa. As in the numerous accounts that described Indian cruelty and torture,29 Foss was graphic in his description of “oriental” horror. He described the “bastinadoe,” and spent pages distinguishing between the numerous methods of execution and reflecting on the brutality of pain the “Algerines” inflicted:“But for murder of a Mahometan he [the perpetrator] is cast off from the walls of the city, upon iron hooks, which are fastened into the wall about half way down. Foss used a similar argument, although he did not apply to Algiers the biblical model of the promised land; North Africa was and had been the land of the great civilizations of Carthage and of Rome. Under those civilizations the land had “abounded with many populous cities, and to have residence here was considered as the highest state of luxury.”32 Muslims had violently replaced the Carthaginians and the Romans—who had become the Christians of North Africa, according to Foss—and as usurpers, had devastated the land.What greatness in “science” and “wisdom” that once prevailed among the Arabs no longer remained. Foss lamented the loss of Carthage and Rome to those “merciless Barbarians, whose very breath seems to dry up every thing noble, great or good.”33 Just as the barbarity of the Indians had justified their conquest, the barbarity of the North Africans also justified their conquest and destruction. Only after they were expelled would the old glory be reinstituted. Only with their annihilation would the Euro-American civilization of the classical world reassume its rightful land.